Easy, fast goodness in a bowl. 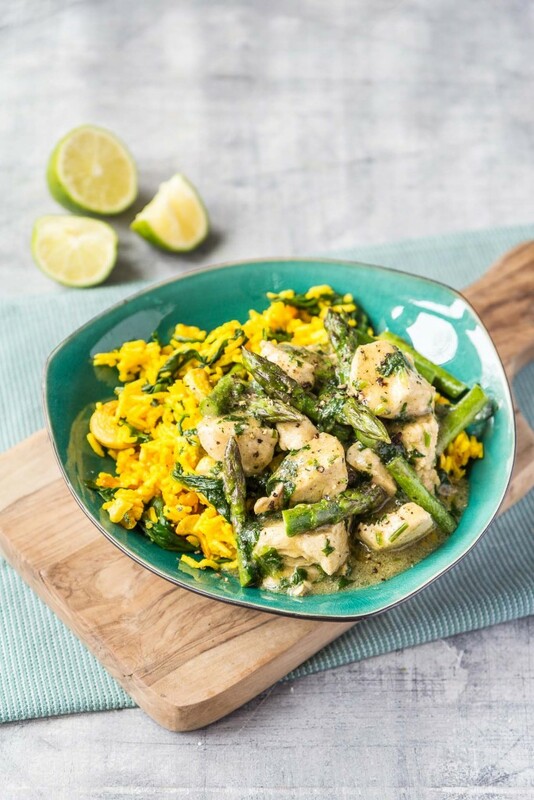 Whip this up in under 30 minutes and give your usual Thai green curry a boost by adding British asparagus towards the end. Begin with the rice. Add the cashew nuts to a deep saucepan and set over a medium-high heat to toast for couple of minutes. Tip into a bowl and set aside. Reduce the heat to a minimum and add the vegetable oil and onion and fry for 10 minutes, stirring occasionally. Whilst the onion is cooking, start the curry by adding the oil to a saucepan set over a high heat. Once hot, add the curry paste and stir, fry for a couple of minutes until fragrant then add the chicken and stir and fry for 5 minutes. Pour in the coconut milk, soy sauce and fish sauce (if using) and season with a little salt and pepper. Bring up to the boil, reduce the heat and allow to simmer for 10 minutes, adding the asparagus for the last 5 minutes of cooking. Whilst the curry is simmering, finish the rice. Add the turmeric to the onion, stirring well to mix, then add the spinach on top. Cover with a lid or piece of foil and allow the spinach to wilt for a few minutes. Tip in the cooked rice and cashew nuts and stir well over a low heat to warm through. Season with a little salt and pepper. Stir the coriander through the curry just before serving. To serve, divide the rice between warm bowls and spoon the curry over the top.